26.2 Quest: What About The Publix Georgia Marathon? 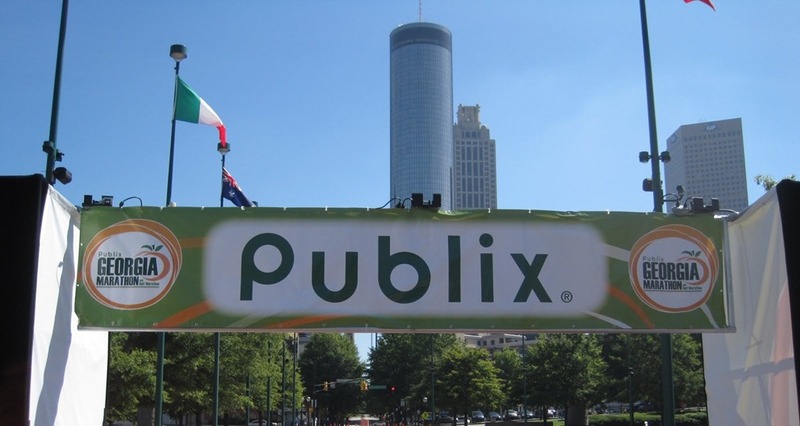 What About The Publix Georgia Marathon? Many of you have just finished a full marathon, while others of you are merely a week or two a way from your 26.2 mile journey. For some of you this will be just another marathon, but to many others it was or will be the first after a long yet exciting journey. If you are like many of the others who have made their way to the only finish line with ancient Greek roots, it will only be the first of many more to come. Do you need a discount or a free entry to fit it into your budget? There are still many more that have not yet decided to make that commitment, and yet they are reading this and wondering – can I do a marathon, should I do a marathon? The best advice I can give you is to find a friend who has run through multiple pair of shoes so they would have the privilege of calling themselves a marathoner and then make your way over to the Publix Georgia Marathon Registration, as I am sure you will be needing it. One of the first questions I was asked when I crossed the finish line of my first marathon was if I planned on doing any more, to which I immediately answered – Absolutely! If you have completed a marathon you know exactly what I am talking about, and if you have finished a half marathon you know the question is not much different for you – you have run a half marathon, are you planning on running a full? Regardless of whether you have just finished your 100th, your first, or are yet to run a marathon the Publix Georgia Marathon is within your reach. With nearly 5 months of training time available it will give you plenty of time to train even if you need some time off to rest from your most recent adventure. The Publix Georgia Marathon was recently awarded the 2012 Southern Region Marathon Championship by RRCA. This will no doubt draw an elite group of runners with names which will be easy to recognize. If you have not yet registered and already have Sunday March 18th blocked off on your calendar you will want to head over and register in the next couple days before the price increase on November 3rd. When you stop by to register at the Registration Page make sure to use the exclusive discount code: 262QUEST to get $10 off when checking out. What about a FREE RACE ENTRY to run the Publix Georgia Marathon? You say that you love discounts, but a free entry interests you as well? Then I have a deal for you that you cannot refuse. I have a code ready for one lucky winner. That code will allow that winner the privilege of running either the half marathon or full marathon courtesy of US Road Sports. One Lucky runner will have the opportunity to run the Publix Georgia Marathon on March 18th, 2012. There are multiple ways to enter, and many which you can use to enter over and over again until the winner is drawn on November 18th. If I have not posted the winner and closed the comments you can still enter, so keep entering and keep promoting it for the best chance to win. Leave a comment and tell us why you want to run the Publix Georgia Marathon (1 time). Tell everyone you know about this giveaway: Share it on Facebook, Twitter, Google+, DailyMile, your blog, a billboard, or even by painting it on the side of your car or etching it on the bathroom stall. Each time you share it come post a separate comment for each share. To make it even better, you can share it each place again every day for additional entries – just come back and comment to let us know of each share for an even better chance of winning. The question is…. how bad do you want this entry? If you haven’t already, make sure you head over to the Publix Georgia Marathon Fanpage, follow them at @GeorgiaMarathon on Twitter, and stop by the Publix Georgia Marathon Website. While you are taking the Social Media tour be sure to look for 26.2 Quest at the 26.2 Quest Fanpage, on twitter @262quest, and subscribe to the RSS Feed to keep posted on this and many other great promotions, thoughts, and a chance to share your opinion. I want to run the Publix Georgia Marathon for free because not only do I have Georgia on my Mind, I ALWAYS have running on my mind! I read the rules as "one share per day", so this is comment for today! Actually, this entry is a given. You can share it anywhere on social media and leave one comment for each of those as well. The one share per day means that you can share it on Facebook once per day, Twitter once per day, etc. The first entry for just telling why you want to run it is a one time entry. Awesome! I'm running my first marathon this weekend in Savannah. I would love to keep right on training, rolling into the Publix Georgia Marathon. This is my first year of running, and I went from hating it to not wanting to live without it. I've always been active in team sports and working out, but running has pushed me to a new level of fitness and occasional mental clarity that I thought was impossible for me. And even though there are still injuries, it's so much less risky than team sports like soccer. Thanks for the giveaway to keep someone (hopefully me) motivated to keep moving! i want to run the publix ga marathon b/c to my surprise, i fell in love with atlanta a couple of years ago when we visited. now we try to make it down at least once or twice a year. 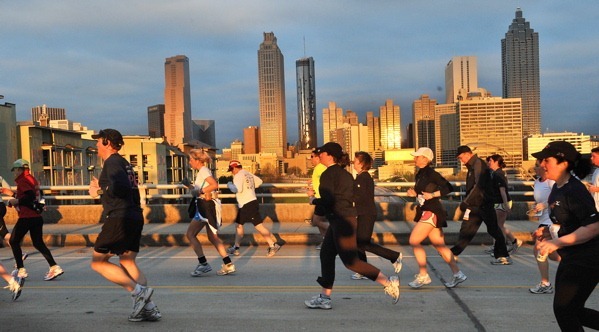 i've never run a race in the city of atlanta and think it would be a gorgeous setting! I want to run the Publix Georgia Marathon to try and break 4 hours! I would LOVE to run the Publix Georgia Marathon! Just on friday I relocated from Boise, Idaho to Georgia and know that running will be the one thing keeping my mind off of being so far away from home. I love running and would love this opportunity to train for this race! New Post on Google+ today which through the magic of the intertubes will make it to Twitter and then over to Facebook. I just ran the Atlanta Marathon this past weekend. Maybe I can run every marathon in Georgia. I want to run Georgia because I've just had to drop my Nov full to a half due to injury. I need a spring full to replace it,Georgia sounds great! I hope someone is keeping track... I think I'm up to 10 now, since I sent it to G+, Twitter and FB today (11.4). I'm still wanting to do a YouTube video, but I'm making more blooper video than anything else! HA! I want to run the Publix GA Marathon for free because my heart is in my running. I enjoy it all my heart and I am most happy when I am pounding out another long, hard run. The sense of accomplishment surpasses all other and I love sharing that passion. Georgia is my home state and I want to be out there to conquer the course of the city one more time! Being a part of something bigger than yourself can make you feel like you are flying, and it can erase that horrible feeling of pain, carrying you all the way to the finish line; it makes you a part of one of the proudest moments in your life. i want to run the Publix Marathon because i'm moving to England the next month and would LOVE to run 26.2 miles through "my" city before we leave! Thanks for the opportunity! i DM'd it and tagged you in the post so you'd see it. Thanks again! I did another tweet today! And a daily mile shout out! Woo hoo! I'd want to run the Publix Georgia Marathon to: 1) beat my last two marathon times, 2) run through Altanta and Decatur -- right by my aunt and uncle's house!, and 3) because who DOESN'T love the South? I tweeted about it (find my name FailedMuffins). I know what you mean about racing being addictive! Normally once I have run one race I immediately want to sign up for another. Congratulations on accomplishing a full marathon! I wanted to do one this year, but I felt like I didn't have enough time to train. It is encouraging that you were able to train for one in 5 months. Keep up the great work! I want the free entry Georgia marathon because it would be my first. It would give me the focus that i need. I've been slacker past couple days, but trying to get the word out for all the last minute procrastinators out there! I posted on Google+, Twitter and Facebook. What time today will the winner be announced? i want to run the publix georgia marathon because i miss sweetwater blue, which would be a great reward after completing an awesomely challenging course!! I'd like to run a marathon in my hometown, so I can sleep in my own bed the night before. Thanks! I started stalking you on twitter! Annnnd, a comment posted on Facebook as well, with a cheesy bathroom joke for good measure. And there it is, bold faced toilet pic all over google+. I shall forever be known as "toilet lady". You are safe, I think Beth at www.shutupandrun.net has that and many other similar titles locked in..... if not even trademarked! Was there a winner announcement? The winner will be announced shortly. When the end date was chosen I was going to be able to announce the winner shortly after, but since then our travel plans were changed and I have been otherwise occupied the last couple days - sorry.